Many times, people with problems would ask counsel from me regarding their money, relationship, or personal troubles. Whether it was from a bad decision or from not making a decision (which is the worst kind of decision), 90% of the time, the problem was self –inflicted… they created their problem. A girl who recently got pregnant asked me, why did this happen to her? As if the answer isn’t obvious enough. When she got the result of her pregnancy test, the guy whom she thought loved her, suddenly vanished. The answer to her question is simple… it happened because of a decision made, and in this case, a bad one. Take a look at people with a big problem today. Their big problem came from the same tiny problem they initially had. Until they learn from a problem and solve it, it will be the same problem, possibly with different manifestations, for the rest of their life. Everyone deals with problems, but life is about solving problems. 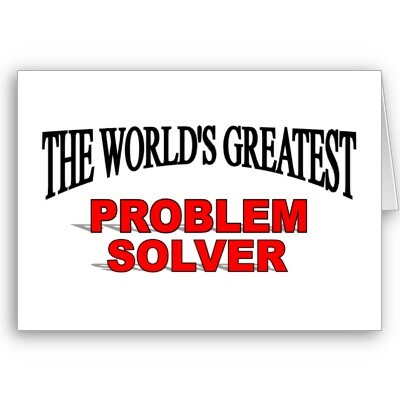 Once you solve a problem, a new one can pop up, then you get to solve that new problem. Now, if you solve a big problem, you become capable of solving bigger and bigger problems, and that will make you a bigger and bigger person. The bigger the problems you solve, the more successful you will be. In fact, successful businesses today made their livelihood from solving people’s problems, even problems that people don’t know they have. After reading this blog, solve that problem you currently have today. The faster, the better.